Outlook: With this stock option trading strategy, your outlook is moderately bearish. You are expecting a mildly drop in the underlying stock price. Limited to the Different in Strike Price of the put options Less Net Premium Paid for the spread. This is a net debit spread as you buy a higher strike put (pay higher premium) and sell a lower strike put (collect lower premium) of the same expiration date. Reduce the cost and breakeven of a bearish trade as compare to buying a put option outright. Profit potential is limited to the Lower strike put sold if the underlying stock price falls. Maximum profit arises only if the underlying stock falls to the lower of the 2 strike price selected. Simply offset the spread by buying back the put options that you sold and selling the put options that you have bought in the first place. 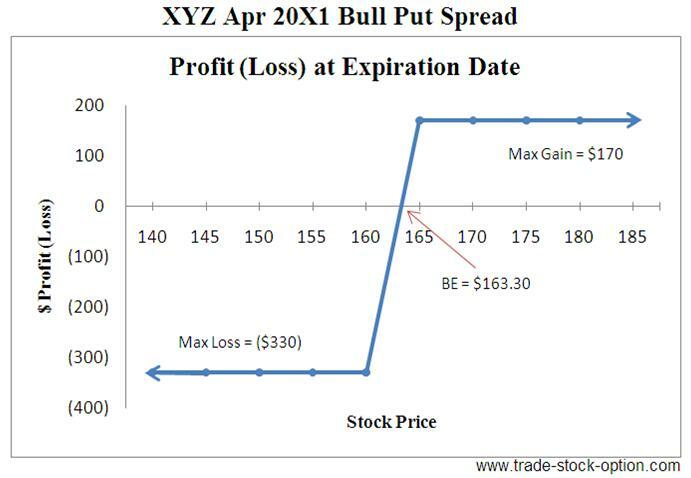 Assumption: XYZ is trading at $69.40 a share on Mar 20X1. You are expecting share price of XYZ to fall mildly. The option premium for the At The Money put is relatively high for you. 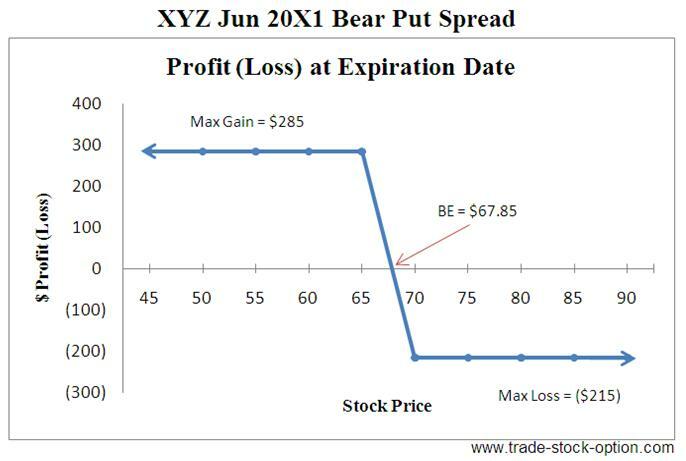 In this case, you may consider to buy one Jun 20X1 $70 strike put at $5.50 and sell one Jun 20X1 $65 strike put at $3.35 to lower the amount of premium payable and profit from the moderately bearish outlook of the stock. Note: commissions are NOT taken into account in the calculation. Maximum Reward = Difference in Strike Price Less Net Premium Paid = ($70 - $65) * 100 - $215 = $285. This is a vertical spread strategy that creates a net debit position in your account. When you entered into this spread, you are moderately bearish on the underlying stock and are looking for a way to profit from a bearish move at a reasonable cost. This is because if a trader is very bearish, he would have bought a put option outright and gain a potentially unlimited profit. The net effect of using this options strategy is to lower the cost and breakeven of the trade compare to buying a put option outright. The bought leg of the spread gives you the leverage. The short leg of the spread reduces your cost and increase the leverage, though at the expense of capping the maximum profit. Try to ensure that the underlying stock is in a downward trend and trade within a limited range of stock prices when you are using this strategy. Identify a clear area of resistance. It is preferably to trade this option trading strategy with at least 3 months to expiration so as to give yourself more time to be right. Use the same expiration date for both legs of the puts. 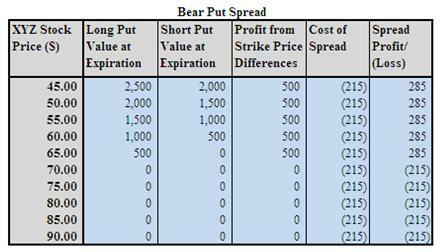 There are literally thousands of Bear Put Spread combinations available. Each has its own unique risk, reward, time frames, volatilities characteristics and probabilities of success. You should pick the strike price and time frame of the spread according to your risk profile and forecast. Selecting the option trading strategies with appropriate risk-reward parameters is important to your long term success in trading spread.